Keestrack also promotes diesel-electric drives in its highly versatile 30-tonne-classes. Examples are the very successful jaw crusher B3e and the full-electric tracked impactor R3e, presented last year. As one of the first manufacturers Keestrack recognized the huge saving potentials and operational advantages of electric drives for highly flexible track-mounted mobile processing solutions with transport weights up to 60 tons. In 2012 the first diesel-electric classifier was introduced, followed in 2013 by the first hybrid scalper and the first hybrid Keestrack crushers with electrified conveyors, followed by electric crusher drives. In these plants, powerful generators ensure low engine speed resulting in fuel-saving operations of the onboard diesels. Downstream screening plants or stockpile conveyors can now be fed via external plug-out supplies, which further improves the total fuel consumption of production trains. With the plug-in option, to connect to the mains, the Keestrack hybrid "e"-versions further enlarged their operating cost advantage over conventional diesel-hydraulic systems. Installed electrical pumps for essential hydraulic consumers (lifting cylinders, track drive, etc.) allow the full-electric operation of today's "e"-versions. Compared to conventional diesel-hydraulic systems, energy costs can be reduced up to 80% - the noise levels during emission-free plug-in operation by about 30% according to Keestrack. Replacing hydraulic drives on conveyors, screen shafts, compressors or water pumps by electric motors also avoid long oil piping with leak-prone hose connections. Thermal problems in operations under extreme conditions are eliminated. With significantly lower oil quantities and extended change intervals the smaller hydraulic systems of Keestrack's "e"-versions not only save the environment but also real money. In full-electric operation, this also applies to lubricants, filters and other wear parts of the onboard diesel. Less engine hours mean less maintenance and downtime, which has a positive impact on total cost of ownership, as well as the higher value retention. And finally: engine problems on a diesel-hydraulic crusher can stop the whole production or job-site, with a plug-in hybrid machine, a total breakdown can be relatively easy avoided by providing an additional external gen-set to ensure the finalization of the project. The new “Drop-Off”-supply modules with onboard diesel and generator can be remotely positioned from the crusher. Thanks to their on-board diesels, Keestrack's modern "e"-versions remain as flexible and highly mobile as conventional technology without having to add a lot of additional transport weight, ± 1000 kg compared to the respective diesel-hydraulic version. By using high-quality steels and the weight-optimized design, Keestrack hybrids still undercut significantly the transport weights of most diesel-hydraulic competitor models of the same capacity. Even the larger hybrid plants can be transported in one piece, without dismantling. This also contributes to short set-up times. The full integration of all electrical system functions are controlled by the intelligent Keestrack plant control. This includes numerous automated routines (eg. sequential start/stop) and the comprehensive monitoring, with bi-directional transmission of machine and production data, via the satellite-based Keestrack-er system. Today, Keestrack already offers 80% of its total 22 models in six series as diesel-electric hybrid variants, 75% of them as fully electric plug-in systems. Depending on technology, type of application and production capacities, customer demand is quite different, but clearly related to the specific additional investment for the hybrid or all-electric system options. According to Keestrack there is a 10-15 % higher initial investment for stackers and screeners and 15-20 % for large mobile crushers. The faster this additional investment can be amortized the more attractive the "e"-option becomes. This is for example the case for quasi-stationary operations via mains on a recycling yard/quarry or more generally for large production schemes with energy-intensive machines. Accordingly, the hybrid portion of sold Keestrack models rises in close analogy to machine size and capacity and achieves for example for large classifiers around 40%, while the giant 500 t/h impact crusher R6 is sold to almost 90 % "hybrid" ("rotor-by-diesel" + full-electric versions). During recent years, Keestrack followed consistently this trend in the development of its product range. Across all crushing technologies and machine sizes existing mobile crusher models have been presented in new "electrified generations" (eg. jaw crusher B3, impact crusher R5). Completely new models or series have even been developed on a specific diesel-electric plug-in design base (eg. R3, B4 + B7, H4 + H6). Some of these models are only available as "e"-version, as the practical advantages and the high gains in cost efficiency of their diesel-electric/plug-in drives are so successful, so there is no reason to provide these in conventional diesel-hydraulic drives. The Keestrack B7e is the latest addition of the company’s crusher range. The 70-tonnes jaw crusher with max. 700 t/h is one of the models, which is only available as full-electric plug-in version. The consistent development of electric drive concepts is far more than a mere modification. This is proved by the numerous innovations introduced by Keestrack during this transition. Among others, these include specific plant componentry, such as the company's own series of compact wind sifters or the new optionally electric driven neodymium overbelt magnets. Despite a much higher separation capacity their weight is considerably lower, even up to 400 kg less than conventional ferrite magnets and this significantly reduces the transport weight of the diesel-electric machines. Another interesting innovation is the "Drop-Off" power-supply module Keestrack is offering on its new all large plug-in plants. On-board diesel and generator are combined in a detachable unit, which can be positioned remotely from the machine, far from dust and vibrations during diesel-electric operation and easy to be accessed for control and maintenance. Since the main control with energy management and all electric drives are installed on the chassis, the drop-off modules can be completely dismantled and stored during plug-in operations via mains. The most advanced and futuristic result of its sophisticated "e"-technology is the new track-mounted stacker S5e "Solar". It is probably the first directly solar-powered mobile processing plant worldwide. Photovoltaic panels literally span like a sun sail over the 23-meter-long conveyor belt. With max. 9 kWh they feed the system battery with a capacity of 23 kWh, installed on the chassis. The conveyor belt (22 kW) and the tracks (2 x 15 kW) are directly electric-driven, an electric pump unit (2 x 15 kW) supplies the hydraulic lifting cylinders. If bad weather causes an insufficient photovoltaic power supply or intensive continuous operation exceeds the solar recharging capacities, the system can be powered or recharged via available external sources, such as upstream diesel-electric crushers and screens, or via mains plug-in. The R6e was in 2013 the first Keestrack hybrid crusher. Its “rotor-by-diesel”-version, was later followed by the optional electric motor for the impactor crusher unit and the plug-in version. The leaders of the C&D recycling industry gathered in Brooklyn, NY - March 10-12 to hear an economic forecast for their industry, how to get and retain workers, and several materials specific sessions as part of C&D World 2019. Michael Gross, Zanker Recycling, San Jose CA, and Clarence "Jay" Giltz, Eagle Crusher, will be inducted into the C&D Hall of Fame, the industry's highest honor, at the Construction & Demolition Recycling Association's C&D World 2019, upcoming this March 10-12 in New York City. Ecowaste Industries operates the Ecowaste Landfill in Richmond, B.C. where they accept inert refuse, mainly from construction and demolition activities. This material is renewed into products such as compost, bark mulch and crushed concrete for sale. At the end of 2018, Ecowaste Industries Ltd. acquired the operating assets and facilities of Urban Wood Recycling and Smithers Enterprises, both based in Vancouver. The transaction was approved by both parties on November 21, 2018 and the sale closed on December 31, 2018. Since the start of the year, Ecowaste has been accepting Urban and Smithers customers at the Ecowaste Landfill in Richmond. Multiple major manufacturers of horizontal grinders have released new models in 2018. HOGS, as they are sometimes called (HOrizontal GrinderS), are unquestionably the workhorse of the wood recycling industry and are a key piece of equipment for composters, land clearing contractors and biomass-for-energy producers, as well as C&D and MSW processors, where in both cases, wood and other organics are part of a mixed stream of materials. 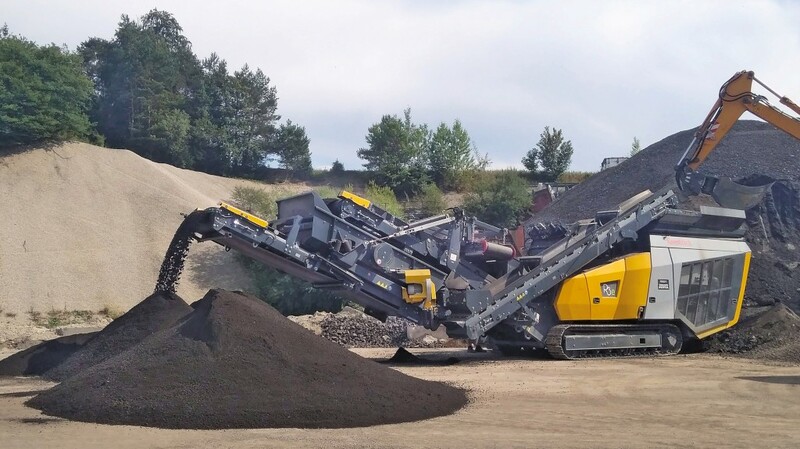 The latest model horizontal grinders feature lighter weights with higher production, increased transportability and site mobility, diesel, hybrid and fully electric power options, along with sophisticated controls systems, and ease of use and maintenance for operators and owners. This article looks at the latest horizontal grinder models and updates from Morbark, CW Mill, Rotochopper, CBI, Diamond Z, Bandit, Vermeer, Precision Husky, and Peterson Pacific. Delegates from all over the world joined together at the inaugural Circular Driven Economy Symposium in London on the 18th - 19th September, to learn more about the opportunities in recovered construction and demolition waste material (C&D waste). Speakers from research bodies like SINTEF, academic institutions like Queen's University Belfast, construction and manufacturing firms like LafargeHolcim and Mapei, and the European Commission all provided plenty for delegates to think about. Lippmann-Milwaukee is pleased to announce three key appointments for the company in the wake of the recent acquisition by McCloskey International.